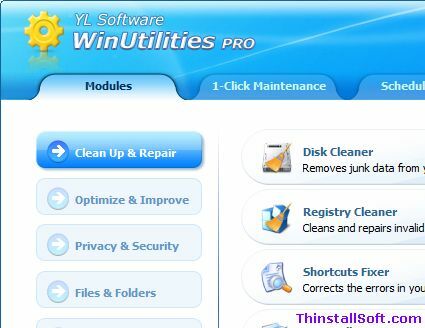 WinUtilities is an excellent optimize and maintain software for Microsoft Windows system. It's a collection of various useful utilities to clean, optimize and speed up your system performance. As an awesome tweaking utility suite, there are 5 modules in WinUtilities: Clean Up & Repair, Optimize & Improve, Privacy & Security, Files & Folders, Registry Tools and System Tools. In addition, you could perform 1-Click Maintenance or Scheduled tasks. Note: Run WinUtilitiesPortable.exe to launch WinUtilities Portable. The current version is WinUtilities 10.61 Free Giveaway Edition. Built-in Tools: Disk Defrag, File Undelete, Disk Cleaner, Registry Cleaner, Startup Cleaner, History Cleaner, File Splitter, File Shredder, EXE Protector, Memory Optimizer, Duplicate Files Finder, Shortcuts Fixer, Process Manager, Uninstall Manager, System Information, Registry Backup&Restore, Registry Search, BHO Remover, Auto Shutdown, Windows Tools, System Control, Task Scheduler, etc. This entry was posted in System Utilities and tagged cleaner, defrag, Disk Utility, Duplicate Cleaner, Duplicate File Finder, optimize, registry, Registry Optimizer, tweak, undelete, uninstaller, WinUtilities. Bookmark the permalink.